Programs Chairperson, Penny Warren did a fantastic job organizing HW’s 1st Annual Meeting. It was held on a blustery autumn day, November 3, at Natural Chimneys Park. Natural Certificates to those who had earned them in 2012. The meeting began at 1pm with a hike of the North River Gorge led by Charlie Huppock and Lynn Cameron. Sophia Cliffe and Kate Guenther stayed behind to set up the hospitality area, and stir the savory stews simmering in the crockpots. Nancy Owen gathered kindling for Kate to start the fire in the hearth. 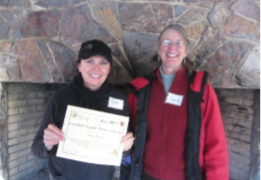 We owe much to Nancy for kindling the Headwaters Chapter. She is the person who spearheaded the Headwaters Chapter Steering Committee . While 20 participants enjoyed their hearty meal by the hearth, Kate G and Dwayne Martin entertained us with drumming while Sandy G played her dulcimer. What a memorable day! October 23, 2013 in Chapter Business.